Some scientific concepts are so taken for granted that they are no longer challenged, despite a lack of experimental data to support them. Researchers who bravely challenge such widely accepted views often encounter resistance from others in the field. 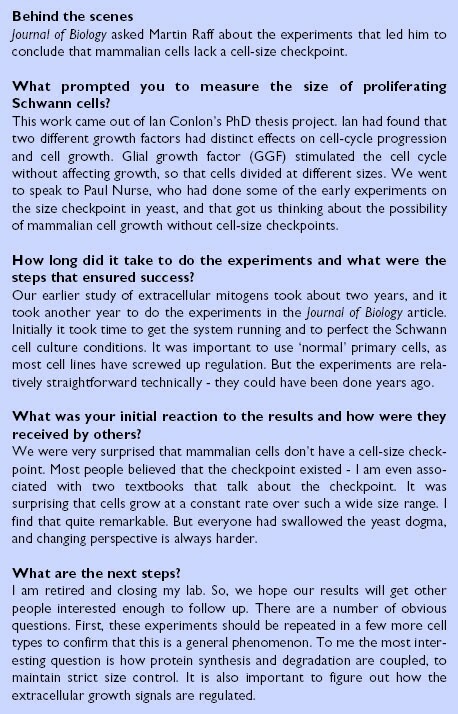 In this issue of the Journal of Biology , Ian Conlon and Martin Raff describe a series of experiments that questions a basic assumption about the way that mammalian cell size is maintained during proliferation, and they demolish widely accepted doctrine (see 'The bottom line' box for a summary of their work). Most proliferating cells in culture maintain a constant distribution of sizes and a constant average size, presumably by coordinating cell growth with progression through the cell division cycle. But it is far from clear how this coordination is orchestrated at the molecular level. Raff was perplexed that such a fundamental issue has attracted relatively little attention over the last couple of decades: the impressive advances in understanding the mechanisms of cell-cycle progression have vastly overshadowed any insights gained into how cells coordinate their growth with their size. "It's quite inexplicable," says Raff, "why this question has been so neglected." Yeast cell biologist Doug Kellogg (University of California Santa Cruz, USA) shares Raff's amazement. "We really don't know very much about this fundamental issue," says Kellogg. "It's one of the last big unsolved problems in cell biology." Much of the current understanding of cell growth comes from experiments performed in yeast, which showed that yeast cells must attain a critical size in order to progress through the cell cycle and divide (see the 'Background' box). In the 1970s Paul Nurse and colleagues identified mutants of the fission yeast Schizosaccharomyces pombe that produce abnormally small cells [2, 3]. These famous wee mutants (named after the Scottish term for small) gave birth to an explosion of discoveries that revealed the central machinery underlying cell-cycle progression. Equivalent whi mutants (named after the bottle of whisky opened to celebrate their discovery) were subsequently isolated from the budding yeast Saccharomyces cerevisiae. "I did lots of experiments in those days, together with Murdoch Mitchison and Peter Fantes, looking at cell size. But the world wasn't interested," recalls Nurse (now at Cancer Research UK, London). "Then, when things went molecular, research on cell size and cell growth sort of stopped". Instead, Nurse and others focussed on the cell division cycle, and the intricate ballet performed by cyclins and cyclin-dependent kinases that coordinate its different phases. The remarkable conservation of the molecular machinery controlling the eukaryotic cell cycle meant that discoveries in yeast were quickly extended to mammals. But as Conlon and Raff now reveal , the mechanisms that coordinate cell growth with cell division do not seem to be similarly conserved between yeast and mammalian cells. When cell-cycle progression is blocked in yeast the cells continue to grow. In fact big cells grow faster than small cells, so cell growth is exponential [2, 3]. This finding suggests that normal yeast cells must operate a 'checkpoint' in order to maintain a constant average cell size: the checkpoint ensures that cells do not continue growing after a certain size (until they have divided). While this cell-size checkpoint operates to prevent cells from getting bigger and bigger, there is presumably another checkpoint that prevents division from occurring before the cells have reached an adequate size, to prevent them getting progressively smaller. Further evidence to support the idea of a cell-size checkpoint came from observations of cell size when yeast were switched from growing in one type of medium to growing in another [2, 3]. In nutrient-rich medium the cells grow faster and are bigger than cells growing in nutrient-poor medium. When cells are switched from nutrient-poor to nutrient-rich conditions they rapidly adjust their size before they divide. "These experiments showed categorically that there is a cell-size checkpoint in yeast," says Conlon. "Everyone assumed the same applied in animal cells, but the question had not really been tested." The mode of cell growth is critical, explains Robert Brooks (King's College London, UK). "If growth is exponential, then cells must have a size control over division, since otherwise random differences in size at division would increase continuously from generation to generation. This does not happen. Conversely, if growth is not exponential, then such a size control is not necessary," says Brooks. "Given that cells only double in size (on average) from one division to the next, it is actually very difficult experimentally to distinguish between linear and exponential growth over such a narrow (two-fold) range," says Brooks. Nurse agrees and stresses the need for very precise measurements. Conlon and Raff overcame these technical difficulties by measuring size over a longer time period than one cell cycle. They blocked cell division using an inhibitor of DNA polymerase α and monitored cell size using a Coulter Counter. "This machine measures liquid displacement, allowing very accurate measurement of real cell volume," says Conlon. He and Raff found that the Schwann cells grew in a linear fashion, adding a constant amount of volume each day, independent of their size. The linear growth continued until cells reached over eight times their normal size. "This is a remarkable feat for the cells – they must really care about this," says Raff. The experiments also revealed that the rates of both protein synthesis and protein degradation increased with cell size, such that the net accumulation of protein is independent of size. "This suggests that big cells know they are big and slow down their net rate of growth accordingly," by increasing their rate of degradation, says Brooks. "It would be nice to know how this works." 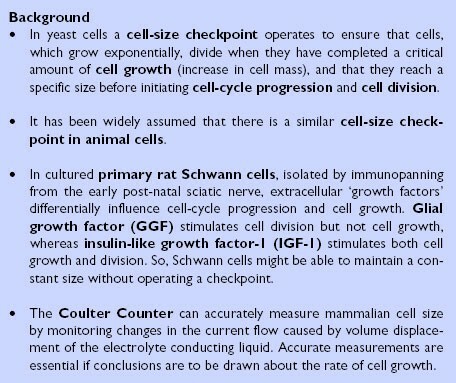 The finding that growth is not exponential (unlike in yeast) suggested that Schwann cells do not need a checkpoint. To further challenge the checkpoint notion Conlon and Raff tried the same type of medium-switching experiments as had been carried out in yeast. But when Schwann cells were shifted from serum-free medium to serum-containing medium it took them around six cell divisions to attain the average size of cells grown in nutrient-rich medium. These results are consistent with the lack of a cell-size checkpoint that prevents division at an inappropriate size. Conlon and Raff suggest that extracellular signals are largely responsible for regulating cell size in Schwann cells. "Animal cells hardly do anything without signals from other cells," says Raff, implying that it is differences in the lifestyles of yeast and animal cells that account for their different modes of regulation. Nurse emphasizes that microbes such as yeast are under a strong selective pressure to respond to their environmental conditions, whereas metazoan cells are not. Kellogg agrees that the yeast lifestyle makes yeast cells quite different, noting that "yeast growth is determined from within, whereas animal cells live as a community of cells." Raff wonders how the metazoan extracellular signals are being regulated and how they are linked to the coordination of protein synthesis and degradation. "They must be tightly coupled," says Raff, citing work from James Franklin and Eugene Johnson who demonstrated that neurotrophic factors regulate the rates of protein synthesis and degradation in sympathetic neurons . The community of researchers investigating cell size is still relatively small, but it is clearly growing. "More and more people are coming back to look at this problem," says Kellogg, who welcomes the renewed interest. Neither Conlon nor Raff, at opposite ends of the career spectrum, will be pursuing the problem further, and they hope that their study will inspire others to tackle this fundamental question of how cells acquire their required size in multicellular organisms. Kellogg expects that there are many layers of redundant mechanisms, making it difficult to tackle genetically and to distinguish between primary and secondary effects. "It's a real struggle but we are going to get around it," he says. He cites a recent study from Mike Tyers' laboratory (University of Toronto, Canada) that used a systematic approach to assess the effects on cell growth of mutation of each of the 6,000 genes in budding yeast ; this study highlighted the importance of ribosome biogenesis in regulating growth. Nurse is hopeful that such genome-wide approaches will one day provide the answer to what limits growth, be it ribosomes, energy metabolism, protein production or gene activation. He wants to see more experiments with different cell types, different patterns of growth and different growth-perturbation conditions. Conlon adds that it will be important to link the extracellular growth signals to intracellular signaling pathways, such as those involving phosphoinositide 3'-kinase and ribosomal S6 kinase, that have recently been linked to cell-size control in flies and mice . After almost 25 years of relative neglect, it looks as though the field of cell-size control is finally growing up. The next decade seems likely to produce results as remarkable as the discoveries of the previous decades about the molecular mechanisms regulating the cell cycle. Now that the misapprehension of a mammalian cell-size checkpoint has been wiped away, there should be a renewed interested in determining how cells grow and maintain a constant size, and what the fundamental differences might be between the regulation of growth in yeast and mammalian cells.